Cloud Computing has quite good contribution in mobile technologies with the effort to develop API and API control for Cloud Server, Cloud Storage, CDN etc. We wrote about API or Application programming interface before and also said about why we need to give importance to Cloud Computing API. When Mobile Computing comes, Cloud Computing and Big Data becomes relevant. This article covers a broader aspect – the full technological highlight related to Cloud Computing and API. We gave it a funky name – Cloud Computing and The Rise of API. It is not easy being a computer specialist in a world where technology changes so quickly. IT professionals must consider not only every technological advance individually, but must also know how to intersect these innovations, exploiting them in combination. 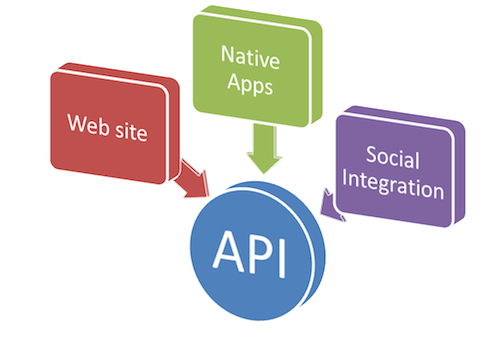 The proliferation of mobile technologies, together with the effort to develop the API used, is an example of this type of intersection that is noteworthy to mention. The application programming interfaces, as we know we are in one form or another is present in computing nearly for 30 years, but in the form of Web API, it only begun to be successful since the launch from Salesforce. From there, e-commerce sites such as Amazon and eBay took off showing how the API for web can maximize profits and serve as the foundation for an entire business model. Subsequently, the technology has evolved, through the creation and development of new web portals and social networks from Facebook to Flickr and Delicious. Amazon in the enterprise branch which was one of the first organizations to realize the potential usage of web-based APIs to deliver IaaS and other as-a-service models. Also in consumer usage, such as for Facebook and Twitter, the sphere of influence of the Web based API has grown exponentially. It was obvious in this context that the mobile industry which represents the next logical step of technology will compact the services with sites like Foursquare and Instagram, this is the basic reason to approach towards the integration of Mobile and their applications closer and closer to the consumer. The provider of streaming video needed to move outside of the data center and needed to grow within the cloud infrastructure to take the advantage of a flexible and highly scalable units in each geographic region important. The companies has achieved this by defining all its assets and resources as API. Needless to say, we can create a server, delete a server, provision loadbalancer easily just from our mobile devices. This Article Has Been Shared 6312 Times! Cite this article as: Abhishek Ghosh, "Cloud Computing and The Rise of API," in The Customize Windows, January 1, 2013, April 24, 2019, https://thecustomizewindows.com/2013/01/cloud-computing-and-the-rise-of-api/.